Photo 1 - Cylindera celeripes at Alabaster Caverns State Park in northwestern Oklahoma. Photo 2 - Cylindera celeripes on lichen-encrusted clay soil at Alabaster Caverns State Park. 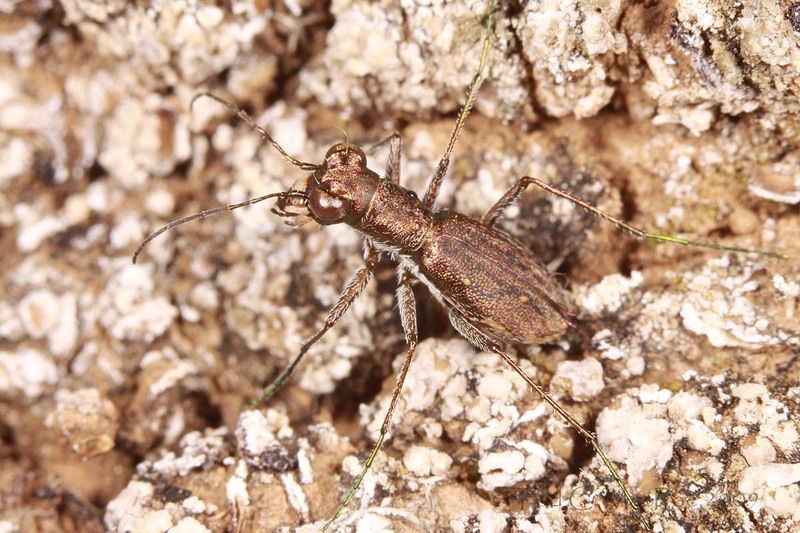 Recall that C. celeripes is one of North America’s rarest and least understood tiger beetles. This tiny, flightless, ant-like species has been recorded historically from eastern Nebraska south to north-central Texas, but its range appears to have become highly restricted over the past century. It hasn’t been seen in Nebraska for nearly 100 years now, and most recent records have come from its last known stronghold in the Flint Hills of Kansas. 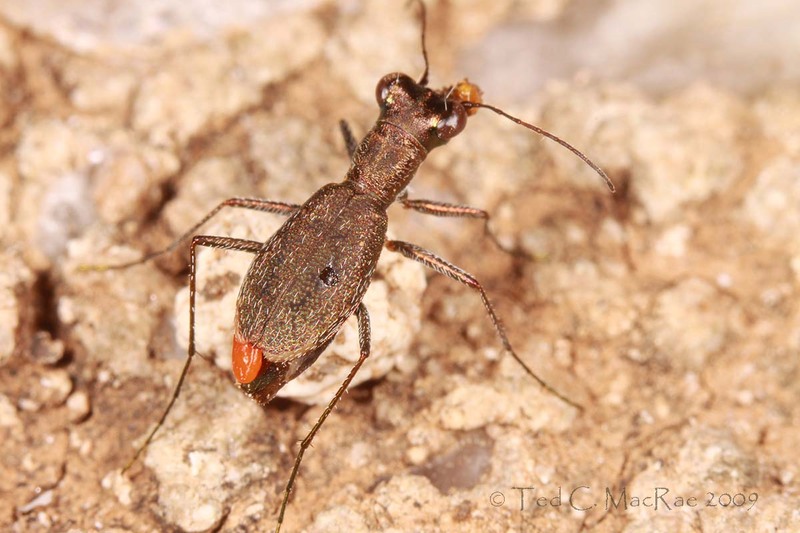 In 2003, however, a photographer by the name of Charles Schurch Lewallen posted on BugGuide a photograph of this species taken at Alabaster Caverns State Park in northwestern Oklahoma, and last year small numbers of adults were seen in the Loess Hills of western Iowa. This last sighting triggered an immediate trip to the site by myself and Chris Brown, who has been co-investigating the tiger beetle fauna of Missouri with me for several years now. The occurrence of this species in Iowa’s Loess Hills had reignited our hopes – faint as they were – that the beetle might yet occur in extreme northwestern Missouri, where the Loess Hills reach their southern terminus. We wanted to see the beetle in the wild to better understand its habitat requirements before resuming our search for this species in northwestern Missouri. We succeeded in finding the beetle – an amazing experience in itself – and brought three adults of this never-before-reared species back to the lab for photographs and an attempt at rearing. We did manage to obtain viable eggs, but we were not successful in rearing the larvae beyond first instar. 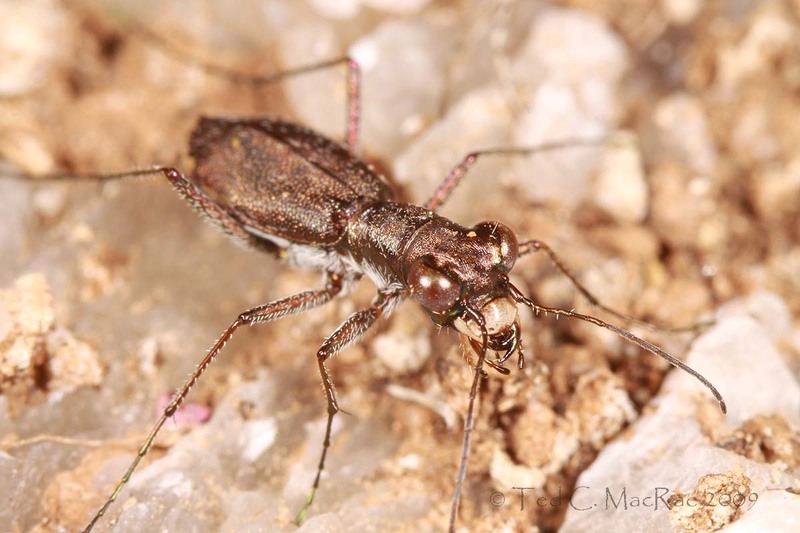 I wrote about that experience last August in a post entitled, “The hunt for Cicindela celeripes” (that post is now currently in press as an article in the journal CICINDELA). Photo 3 - Cylindera celeripes on gypsum exposure at Alabaster Caverns State Park. Thus, when my friend Mike asked me earlier this year if I might be interested in joining him on his return trip to Four Canyon Preserve in June, I jumped at the chance. I figured I could look for celeripes at the preserve, and if I failed to find it there then I would go to Alabaster Caverns and see if I could relocate the beetle where it had been photographed in 2003. 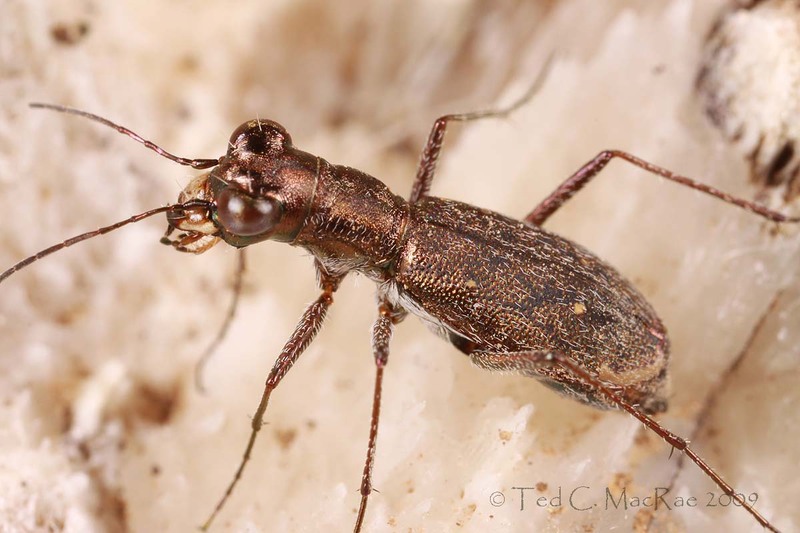 My goals were modest – I simply wanted to find the beetle and voucher its current presence in northwestern Oklahoma (and if possible photograph it in the field with my new camera!). Before leaving, I wrote to Charles Lewallen, who graciously responded with details regarding the precise location and time of day that he had seen the beetle at Alabaster Caverns, and on the first Friday of June I followed behind Mike and his lovely wife Jane during our ten-hour drive out to Four Canyon Preserve. 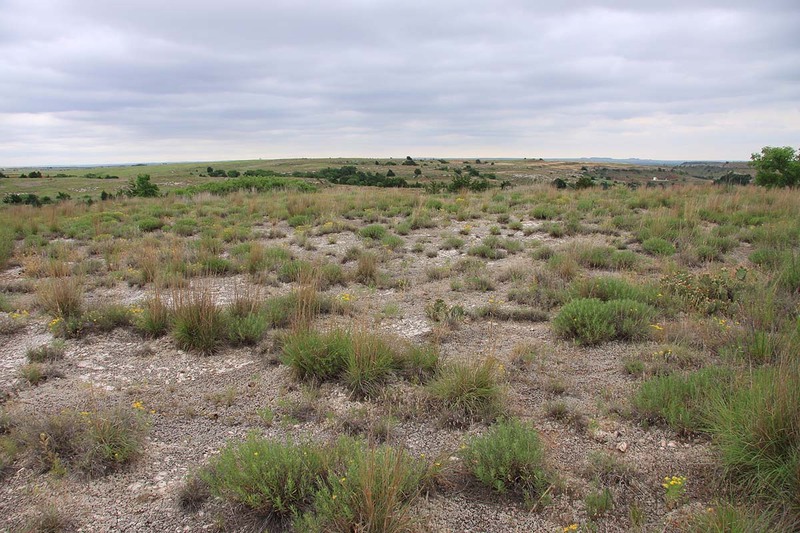 For three days, I roamed the mixed-grass prairie atop the narrow ridges and dry woodland on the steep, rugged canyon slopes of the preserve – always on the lookout for that telltale “flash” between the clumps of bluestem and grama, ever hopeful that one would prove not to be the ant or spider that it appeared to be (and, indeed, always was). Many tiger beetles would be seen – chiefly the annoyingly ubiquitous Cicindela punctulata (punctured tiger beetle), but celeripes would not be among them. Whether this is due to historical absence from the site or a more recent consequence of the wildfires that swept the area a year earlier is hard to say, but its absence at Four Canyon meant that I would need to make a quick, 1-day detour to Alabaster Caverns before rejoining Mike and Jane at Tallgrass Prairie Preserve in northeastern Oklahoma, where we planned to spend the second half of the week. Photo 4 - Cylindera celeripes on gypsum exposure at Alabaster Caverns State Park. Arriving at Alabaster Caverns I was filled with nervous, excited anticipation. Would I find the species, as Charles Lewallen had, or would I get skunked? I kitted up and started walking towards the area where Charles wrote that he had seen the beetle, noting the annoying “Removal of plants and animals prohibited” sign along the way. I hadn’t taken ten steps off the parking lot when I saw it! I froze at first, hardly believing that I had found it that quickly, then started watching the tiny beetle as it bolted urgently from one grass clump to the next. Recalling my experience with this beetle in Iowa (and fearing I would lose it amongst the vegetation), I captured the specimen and placed it live in a vial – I would talk to the park staff later about taking the beetle, but for now I needed to guarantee I had a backup for the lab in case I was unable to get field photographs of the beetle. I started walking again, and within a few minutes I saw another one – okay, they’re here in numbers. I carefully took off my camera bag and assembled the components, all the while keeping my eye on the beetle, and then I began trying to do what last year had seemed impossible – getting field photographs. It was easier this time – the vegetation was not so dense, so I could keep an eye on the beetle as he darted from one clump to another. I tried to wait until he settled in an open spot, but it soon became apparent that just wasn’t gonna happen without a “helping” hand. I started blocking the path of the beetle as he tried to dart away and then removing my hand to see if he would stay put. There were a few false starts, where the beetle looked like he would sit still and then dart just as I was set to take the shot, but eventually it wore down and started sitting still long enough for me to shoot a few frames. Torn between the need to get as many photographs as possible and the desire to look for more beetles, I decided to look around more to see how common the beetle was. As I walked out into the shortgrass prairie above the canyons, I began to see adults quite commonly. Most often they were seen as they bolted out into the open from a clump of vegetation when disturbed by my approach. 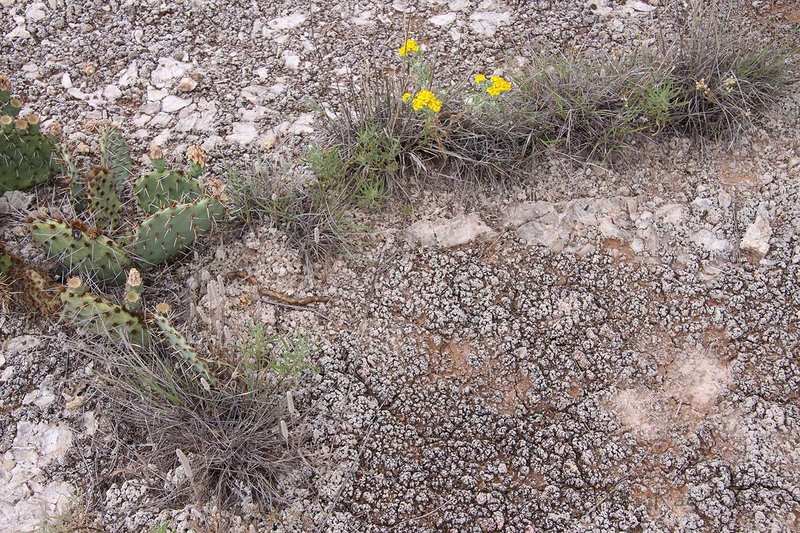 The substrate was red clay and gypsum – just as I had seen in Four Canyon Preserve, but unlike that area the clay exposures were heavily colonized by a mottling of green, blue, and gray lichens. It made the beetles almost impossible to see when they were not moving – even at close range! I spent about an hour taking photographs of several individuals, even managing to photograph one that appeared to be parasitized by what I take to be a dryinid hymenopteran. Photo 5: Cylindera celeripes with parasite (dryinid hymenopteran?). Note also the ant head attached to right antenna. After getting a sufficient series of photographs (is there really such thing? ), I went to the park office hoping to convey the significance of this find to the Park Naturalist and to convince him/her to let me take some live individuals with me for another attempt at rearing. The Park Naturalist was out of the office, but the Park Historian was there. I could hardly contain my excitement as I explained to her what I had found, why it was so important, and my hope to try to rear the species with adults collected in the field. She not only responded as positively as I had hoped, but accompanied back out into the field so that I could show her the beetles. She told me it would be no problem to take some live individuals for rearing and to please let them know if there was anything else they could do to help me. She then provided me with the day’s natural history “dessert” by pointing out a Mexican free-tailed bat (Tadarida brasiliensis) – Oklahoma’s state flying mammal – roosting up in the top of a nearby picnic shelter. Standing atop the picnic table put me within arm’s length of the little chiropteran – close enough to see his tiny little eyes looking quizzically back at me. Photo 6 - Cylindera celeripes macrohabitat at Alabaster Caverns State Park. Note rather widely spaced clumps of vegetation. It had begun sprinkling rain by then, so with some urgency I got my tools, extracted a couple of chunks of native soil and transferred them to the small “Critter Totes” that I had brought for the purpose, and began searching for live individuals to place within them. The beetles had become scarce as the drizzle turned to light rain, and by the time I had split about a dozen individuals between the two containers the rain was coming down hard enough to start puddling. I continued a last ditch effort to find “just one more,” but a lightning strike within a mile of the park put an end to that – the air now felt electric as I hurriedly walked back to the car (gloating unabashedly inside) and began the three-hour drive towards Tallgrass Prairie Preserve… (to be continued). Photo 7 - Cylindera celeripes microhabitat at Alabaster Caverns State Park. Note thick encrustation of lichens on clay substrate amidst white gypsum exposures. #1-3, 5: Canon 100mm macro lens w/ 68mm extension on Canon EOS 50D, ISO 100, 1/250 sec, f/13 (photo 3, f/11), MT-24EX flash 1/4 power through diffuser caps. #4: Same except Canon 65mm 1-5X macro lens, flash 1/8 power. #6: Same except Canon 17-85mm zoom lens (17mm), 1/64 sec, f/8, natural light. #7: Same except Canon 17-85mm zoom lens (35mm), 1/100 sec, f/7, natural light. This entry was posted in Cicindelidae, Coleoptera, Dryinidae, Hymenoptera, Mammalia and tagged bats, beetles, behavior, conservation, entomology, Great Plains, insects, landscapes, lichens, mammals, nature, Oklahoma, parasitic wasps, parasitism, prairies, science, tiger beetles. Bookmark the permalink. That made my morning! I need to accompany you on one of these adventures some time. What additional species beyond C. punctulata did you encounter? Hi Doug – I’d love to have you out in the field with me some time. The area looks great for a number of more interesting species – C. celeripes, Dromochorus pruinina, and Amblycheila cylindricollis were foremost in my mind. Later in the season I would think that C. pulchra might be a possibility. Whether these species are actually there and what impact the recent wildfire may have had on that are difficult questions. We need a film crew to follow you around. Awesome shots, Ted. I’m sucked into this story! Thanks, Alex. If folks find this story even half as captivating as your search for the Mexican blue piñon, I’ll be very happy. 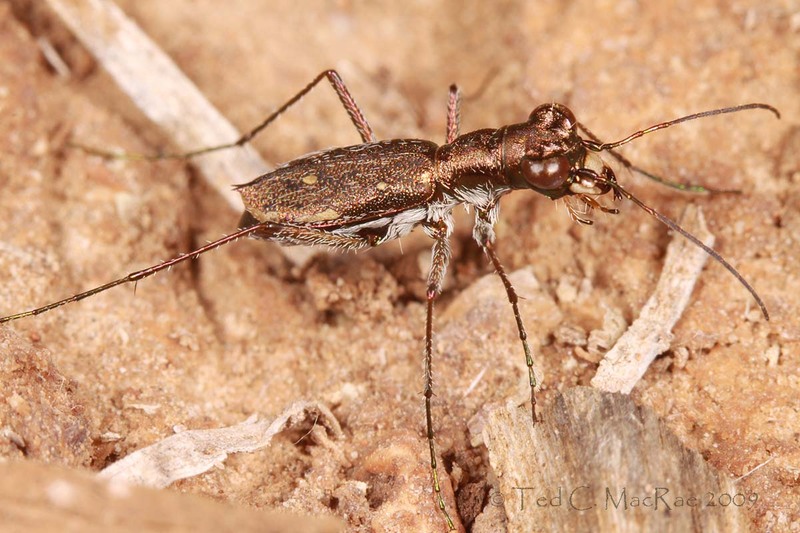 Gorgeous tiger beetle- I’m imagining a scale model about 6 inches long on a desk, in bronze! Hi Beau – that would be gorgeous indeed! Very good timing re the storm! What permits if any do you need to have over there to collect in such reserves? The historian was very helpful! Any other entomologists about? Will read on and comment! Love the photos! This is really a great blog! Hi Trevor. Permit requirements vary tremendously among and within states. Some (like Oklahoma) allow park staff to grant permission on the spot at their discretion, while others (like my home state of Missouri) have more centralized permitting processes. They also vary depending on the managing agency – for example, the U.S. National Park System has a rigorous, highly centralized (and onerous) permit application process, while the Forest Service and Bureau of Land Management have no permit requirements at all (with exceptions for designated wilderness areas). My approach, when lacking appropriate permits to begin with, has always been to engage refuge staff up front and explain the research that I’m doing and its importance. If they have the discretion to grant permission on the spot, they’ve almost always done so. There are others who would have gone ahead and collected specimens surreptitiously without involving park staff – perhaps they are less concerned about their reputation as scientists and legitimate researchers than I. It is exceedingly rare to encounter another entomologist in the field unless you go to one of our collecting “hot spots” (e.g., southeastern Arizona). Thank you so much for your kind feedback – it is much appreciated! I just stumbled on this page. Glad you found what the tiger beetle. Hi Charles – it was an exciting experience, knowing how few people have actually encountered this species. Thanks so much for your help!